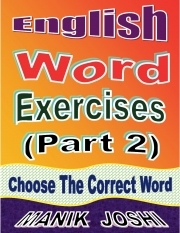 Description of "English Word Exercises (Part 2): Choose the Correct Word (eBook)"
01. Congratulatory messages ____________ in from all parts of the country. 02. He furnished a ____________ fine of dollar 1 million. 03. Heavy downpour ____________ buildings and vehicles across the city. 04. Power supply resumed after power officials ____________ the problem. 05. She was ____________ with having mild breathing difficulty. 06. They were ____________ from service after their certificates were found to be fake. 07. This offence ____________ a jail term of up to six months or fine or both. 08. Vehicular traffic in the hilly region was affected by ____________ rainfall. 09. We are trying to ____________ source from where the victim caught infection. 10. We have to ____________ with the laws of the land. 11. ____________ that students do not use unfair means in the next exam. 12. Anti-party activities will not be ____________, however big the person is. 13. With coal and petroleum products becoming ____________ in the near future, scientists should venture into producing solar energy through researches. 14. He ____________ serious head injuries and is in coma. 15. Principal ____________ a meeting with teachers to resolve the issue. 16. It was at the ____________ of his four-year-old elder daughter, that he bought a car four months ago. 17. She ____________ a huge political row by saying she feared for her life. 18. Silt from overflowing rivers ____________ the pipelines. 19. State government has not yet ____________ the scholarship amount. 20. The effect of these steps needs to be ____________. Reviews of "English Word Exercises (Part 2): Choose the Correct Word (eBook)"